End the bloodline of a false hero. Talk to Malacath's Statue at the shrine of Assurdirapal. Travel to Gnaar Mok and slay Farvyn Oreyn. Return to Malacath's Statue and receive Helm of Oreyn Bearclaw as your reward. The shrine is located in Assurdirapal in the Sheogorad region on the long island west of Dagon Fel (just west of the Sanctus Shrine island). Talk to Malacath and he will tell you a story about an elven hero by the name of Oreyn Bearclaw. Actually, he is no hero at all but was falsely credited with the deeds done by his friend, an Orc named Kharag Gro-Khar. Malacath wants you to destroy Bearclaw's legend by killing the last of his bloodline. If you do, you will receive the Helm of Oreyn Bearclaw as your reward. Head toward Vivec as suggested by Malacath to begin your search for the descendant. 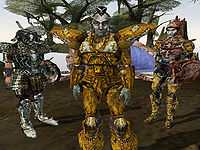 You should be able to find out that the last of Bearclaw's line is Farvyn Oreyn and that you can find him near Gnaar Mok. Ask some townsfolk to find out where he is, south of town. You will find him clad in Dwemer armor and in the company of two bodyguards. If you talk to him, he will freely admit that the legend of Oreyn Bearclaw is a falsehood. Telling him you have come from Malacath, or promising to keep the truth a secret will result in him and his guards attacking you. Farvyn is fairly easy to kill, but his two bodyguards are not, so be careful. Once you have killed him, return to the shrine to pick up your reward. Farvyn is actually not the last of his bloodline, as you'll discover in Oblivion. 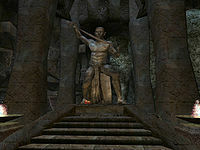 Modryn Oreyn, second-in-command of the Fighters Guild in Chorrol, is also a descendant, and states that the helm was returned to him by a stranger from Morrowind. The two dead Bull Netch near Farvyn Oreyn and his guards have unusually-large touch boxes, which may prevent you from looting the bodies. Lure Oreyn and his guards well away from the Netch before killing them if you want their gear. Also you can remove the Netch corpses opening the console, clicking on the Netch, typing "Disable" (without quotes) and pressing enter. 10 I entered the shrine of Malacath and summoned the Daedra. He spoke to me of a helm of great power, once belonging to the elven hero Oreyn Bearclaw. In reality, he was no hero, though. The deeds attributed to him were actually performed by an orc, Kharag gro-Khar. If I can find the last of the Oreyn family bloodline, and kill him, I will be rewarded with the helm. 30 The people of Vivec have told me that Farvyn Oreyn is a powerful battlemage, and is often surrounded by his entourage of servants. He is, however, not in town. He has been carrying on the traditions of the Oreyn family, and it is rumored he was heading toward Gnaar Mok. 40 The people of Gnaar Mok have said that Farvyn Oreyn is in the area. He and his servants were heading out to an island to kill some of the netch that had been plaguing the area. 50 I have spoken with Farvyn Oreyn. He denied nothing about the false tales of heroism told about his ancestor. Looking at him, he seems unimpressive. His "servants," on the other hand, are far from it. 60 I have killed Farvyn Oreyn. He was, as I suspected, remarkably weak for one of such a "distinguished" bloodline. His guards were, however, as strong as they looked. 70 Finishes quest I've returned to the shrine of Malacath, who already knew of my success in killing Farvyn Oreyn. Malacath was as good as his word, and I now have the Helm of Oreyn Bearclaw in my possession. It is a fantastic helm, misnamed though it may be. This page was last modified on 26 September 2018, at 03:25.